Sagar University in Madhya Pradesh has been in the forefront of bringing traditional Yoga teachings into the academic setup. A great deal is owed to Dr Joshi who upon deputation by Swami Kuvalayananda went to the university and built up a formidable Yoga department. His work has been continued in later years by Dr Ganesh Shankar who also served as Director of the Central Council for Research in Yoga and Naturopathy when it was under Ministry of Health and Family Welfare. In Bhopal Prof SV Rao in the Government Medical College has been an inspirational figure for Yoga Research who as both a physiologist and Yogi propagated a scientific view of Yoga on many platforms. Yogarathna KM Ganguly, a successful businessman turned Yogi has been an example of how Yoga Sadhana can be combined successfully with the material success. Even at a very senior age, his performance of Yogasanas used to put others younger to him by decades to shame. The western part of India has seen the emergence of the Brahma Kumaris world spiritual university as a great institution for propagating Raja Yoga Meditation. With their head quarters at Mt Abu they have spread all over India and the world. Founded in the 1930s by Brahma Babu (1880-1969) and run today by Dadi Prakash Mani, the Brahma Kumaris teach that we must turn inward to realise that we are the pure peaceful soul. Suraj Karan Jindel, of Jaipur has been acclaimed as the ‘Nauli Man” for his flawless performances of the Nauli Kriya and other Shat Karmas. A successful lawyer he has been instrumental in creating great interest in Yoga in Jaipur and Rajasthan. Dr. Virendra Singh has done a lot of research in Yoga and designed the Pink City Flow meter for Asthma patients. The state of Maharashtra has been a great source of joy to Yoga with two illustrious disciples of Paramahans Madavdasji going on to create world famous Yoga institutes. Swami Kuvalayananda founded Kaivalyadhama at Lonavla, while Sri Yogendra founded the Yoga Institute at Santa Cruz in Mumbai (formerly Bombay). Swami Kuvalayananda (1883-1966) who was known as Jagannath Ganesh Gune prior to Sanyasa rendered yeoman service to the cause of scientific Yoga. He founded Kaivalyadhama in 1924 and also started the famous journal ‘Yoga Mimamsa”. Swami Kuvalayananda was also to a great extent responsible for Yoga becoming a college subject and for Yoga colleges and universities replacing traditional Ashramas. Many eminent personalities such as Mahatma Gandhi and Jawaharlal Nehru used to take his advice regarding Yoga and Yoga therapy. Swami Digambarji succeeded him and now Swami Maheshanandaji is the Director while Sri OP Tiwari is the secretary. Sri OP Tiwariji who is acknowledged as one of India’s senior most Yoga experts is currently the President of the Indian Yoga Association as well as the Chairperson of the Council for Yoga Accreditation International (www.cyai.org). Kaivalyadhama has over the past nine decades years done a great amount of literary and scientific research in the field of Yoga and also conducted numerous national and international Yoga conferences. Shri RS Bhogal is Assistant Director Research while Dr BR Sharma is principal of GS College of Yoga and Cultural Synthesis. Sri Subodh Tiwari is the able administrator of Kaivalyadhama while the Yoga Seva of so many stalwarts such as MV Rajapurkar, MV Bhole, TK Bera, RK Bodhe, MM Gore, PV Karambelkar, ML Gharote and SL Vinekar have contributed to a greater understanding of Yoga through their scientific and literary research. Sri KS Joshi upon the deputation by Swami Kuvalayananda went to Sagar University and developed the Yoga department as one of the best in the country. The Yoga Institute at Santa Cruz in Mumbai is a standing testimony to the insights of the great Yogi Sri Yogendra who founded it in 1918. He was a pioneer in taking Yoga to the West by founding probably the first ever Yoga Institute in America, in Harriman Tuxedo Park, New York in the year 1919. A student of Paramahamsa Madhavdasaji his Bani is very different from that of Swami Kuvalayananda and the emphasis is on “Householder Yoga.” Yoga for the modern world is one of the teachings at this centre and many busy executives have benefited from the Yoga offered here. Shri Yogendra who received initiation in Yoga from his Guru, at his asharma at Malsar where he stayed for two and a half years felt that Yoga is an essential science of living which would benefit one and all. In the early years of his struggle to popularise Yoga, he was assisted by his wife, mother Sitadevi, who was the first woman to write a book on Yoga for women. His son, Dr. Jayadeva Yogendra, the present President is ably supported by his wife Smt. Hansaji Yogendra, the present Director, who is Vice President of the Indian Yoga Association, Chairman of the Certification Committee of Quality Council of India and President of International Board of Yoga. They have systematised their teachings of Yoga to make it experiential thus making the Yoga Institute a Life School where one can learn the art of living. The teachers training programs started in 1958 have trained thousands of sadhakas thus bringing the message of Yoga to all. The Yoga Institute has published many books on Yoga of which four have been preserved in The Crypt of Civilization in the Oglethorpe University, USA to be opened after 6000 years in 8113. The research work of the Institute deals with education, Indology and Therapeutics and has been published in books, national and international journals. In recent time Shri Hrishi Yogendra, Assistant Director and his wife Pranee Yogendra, the Dean, have begun taking an active interest in the working of the Institute; thus signalling the involvement of the third generation of the legendary Yogendra family. Smt. Hansaji sums up their mission by saying, “The Yoga Institute’s teachers’ task is to ensure that their students become better contributors and better humans.” Dr. Jayadeva adds, “the aim of Yoga is the growth of consciousness” thus conveying clearly what The Yoga Institute stands for. Padma Vibhusan Sri BKS Iyengar who left his body at the age of 96 went to Pune in 1937 upon the invitation of the Deccan Gymkhana Club. He settled down there and founded the Ramamani Iyengar Memorial Yoga Institute. His system of Yoga now known as Iyengar Yoga has a worldwide following. His book “Light on Yoga” remains one of the best instruction manuals for Yoga and is the standard text book for Yogasana competitions in the Yoga Sports movement. This book first published in 1966 is still undergoing reprints and has been translated into 28 languages. Subsequently, he has written 30 books including Light on Pranayama, Light on Yoga Sutras of Patanjali, Light on Ashtanga Yoga, Light on Life, Core of the Yoga Sutras and Yoga for Sports. He innovated the way students could attain precision in their practice of asanas by the development of Yoga props, including the now famous Yoga mat. These Yoga props have helped the sick, the disabled, the aged and the weak to practice Yogasanas efficaciously. He was first invited to the West by the famous violinist Yehudi Menuhin in 1953 after which he took Yoga to all corners of the world. His last trip was at the age of 93 to China where he personally taught 1200 Chinese enthusiasts. He was named as the 100 most influential people in the world by Time Magazine and even the Oxford English Dictionary defines Iyengar as a form of Yoga. 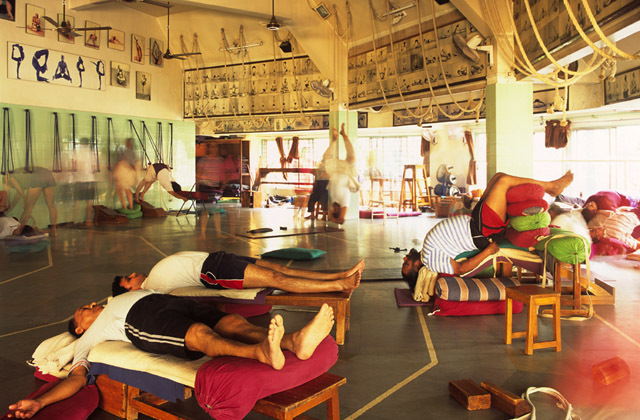 Today, there are certified Iyengar Yoga teachers in 80 countries. There are about 75 scientific research papers from Universities across the world about the efficacy of Iyengar Yoga as a therapeutic modality for health disorders. His daughter (Geeta Iyengar) and son (Prashant Iyengar) are now in the forefront of leading his students who have centres worldwide. Guruji as Sri BKS Iyengar is known, was the Founder President of the Indian Yoga Association, a self-regulating association of the important Yoga traditions of India (http://www.Yogaiya.in ). Yogashri Ma Yoga Shakti at Gondia in Maharashtra has been an example of the feminine Shakti in the field of Yoga. A disciple of Swami Satyananda, she has charted her own novel path that emphasises the Bhakti Yoga path. Yoga in Contemporary India: An overview, is an essay written Dr. Ananda Balayogi Bhavanani. This article series keenly observes the lineages of well-known Yoga schools and research centres in India.